It was a Wednesday night, and it already felt like we had done a full week. You know that feeling, when the days of the week are dragging by and you’re just living for the weekend. On this particular Wednesday night, both my boyfriend and I felt absolutely shattered and the thought of cooking was unpalatable. So, we decided to go out for pizza. Pizza is not usually my first choice when deciding what to eat. This is not because I’m a mad person who doesn’t like pizza but mainly because I don’t hold the opinion that ‘pizza’s pizza’. I think it has to be done right. In the right oven, with the right dough and the right toppings. 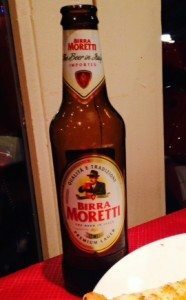 We’d heard rumours about this little place on Western Road (the Hove end) called Morelli Zorelli’s which was fast being hailed as one of the best artisan pizzeria’s in Brighton and Hove. What I instantly liked about Morelli’s was how unassuming it is. By unassuming, I mean this as a huge compliment. It’s like it knows how good it’s pizza’s are, it doesn’t need to draw people in by big, fancy signage, or sparkly, flashing lights. It’s a small restaurant with 4 or 5 tables upstairs in front of the giant wood fire oven where the pizzaiolos work. Downstairs, there’s more seating in a quiet, cozy area if you want more privacy and seclusion. We wanted to sit upstairs and watch our pizzas being made so we chose a table for two by the window. Within minutes, you feel like you’re in Italy. Every part of Morelli’s screams authenticity. It’s simple, genuine and rustic. We felt at home and like we were on holiday in Rome all at the same time. We were greeted by the manager Ken like we were old friends. He told us that all the pizzas were made with sourdough, giving it a unique flavour and airy texture. 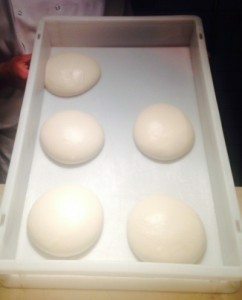 The dough is made and refreshed lovingly everyday in house. All the ingredients for the dough and the sauces are imported from Italy. They combine this authenticity with a local touch by getting their meat toppings from local farmers and Sussex suppliers. The meatballs for example are made and supplied by Brighton Sausage company. where we were sitting. It adds a certain element of ‘drama’ to your meal when you can see it being passed into flames. Morelli’s menu is again simple and no messing. I liked this as for me it was further proof of authenticity. The list of pizza choices comes to a good size of 18, but selected in way where there’s something for everyone. Plenty of meat options, veggie and fish/seafood. There’s also all the accompaniments you need for a pizza including garlic bread, marinated olives and salad. We started off by ordering some garlic bread with cheese and a portion of olives. As for drinks I had a glass of the house red; Tommy a house beer. Both Italian of course. The olives were firm and juicy and plentiful. The garlic bread was a pizza base oozing with garlic butter and fresh mozzarella. Gorgeous. My mouth is watering with the memory. As for the ‘vino’, considering there was only a choice of one, they had obviously selected it very well as it was smooth and velvety and went down a treat. By now with our tastebuds woken up and thirst quenched, we were ready to order our mains. 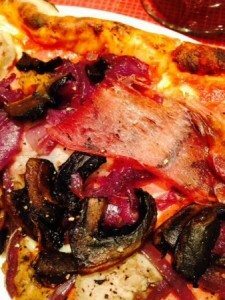 We went for the ‘meat feast’ though they don’t name their pizza’s in this way but simply list the ingredients: Wild boar prosciutto, handmade meatballs (supplied by Brighton sausage company), pancetta, Italian sausage, mushrooms, caramelised red onion. 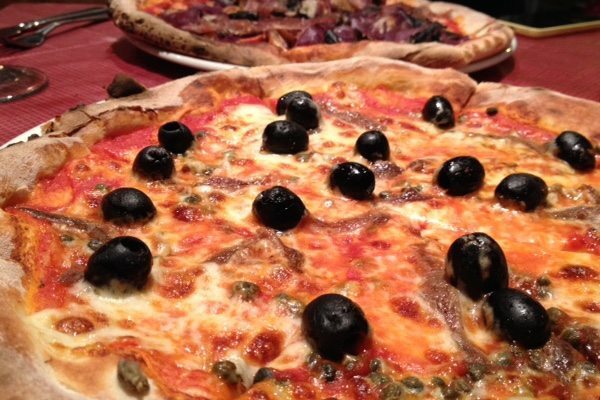 To offset this carnivorous feast, we chose the classic Anchovies as our second pizza: Fior di latte mozzarella Anchovies, olives and capers. 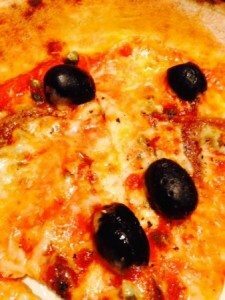 As well as providing a carefully selected range of pizza toppings with fresh, local and authentic ingredients, Morelli’s caters for all lifestyles. Not only vegetarian but vegan and gluten free too. How can you make a decent vegan pizza I thought in my ignorance. Well, Morelli’s can. Not only do they have vegan cheese but even vegan sausages. They don’t charge extra for this either. Whilst we were waiting for our pizza’s, we simply sat back and enjoyed the mellow music and relaxed atmosphere. I felt my long week melting away. 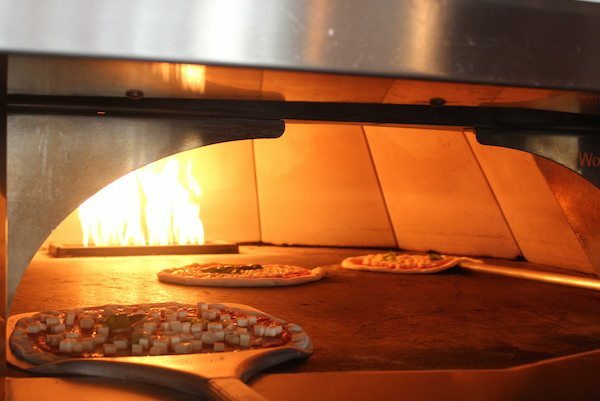 When the pizza’s hit the table, the fantastic smell of the freshly baked dough and hot, juicy toppings hit us too. Being artisan, neither pizza looked the same, another plus for this place. If both pizza’s were exactly the same size and shape I would have been suspicious. In keeping with our love for variety, we went 50:50 so that we could each try both. The meat one was absolutely packed with large shreds of prosciutto, big hunks of meatballs, sliced sausages and chunks of pancetta. It was juicy and full of flavour. The dough was soft and chewy with a crusty coating. Pizza perfect. The anchovy one was deliciously salty as you would expect, offset with the juicy tanginess of the olives and capers. We barely spoke a word throughout. All you could hear from our table were a few murmurs of pleasure and a few happy sighs. Although, I couldn’t get through all mine, and Tommy was done by the time he finished his, I was happy as I knew my lunch at work the next day was going to be no ordinary one. Leftover cold pizza when it’s a ‘good pizza’ is something else. We couldn’t manage dessert but if I could have I would definitely have gone for their Affogato. If you’ve not had it before, it’s an Italian dessert which is literally a good quality scoop of vanilla ice cream, with equally good quality hot Italian espresso poured on top. It’s simple, elegant and is pure pleasure. I left Morelli Zorelli’s feeling happy, relaxed and satisfied and looking forward to the weekend. It’s authentic, rustic and simple. They use good quality, fresh ingredients to create the most delicious, fresh tasting, artisan pizzas and obviously care about what they do. The result of this is a true taste of Italy in a comfortable and relaxed setting. Definitely a place I’ll come back to. On any night of the week. If you’re lucky enough to live within 3 miles of Morelli’s you can bring it into your home without even leaving your sofa.